Monument commemorates the discovery of gold at Pinkey Point in 1854. Gold was first discovered in the vicinity at Pinkey Point, six kilometres west of present-day Ararat in 1854. Other leads followed and there were soon 9000 people within the area known as `Cathcart` which was named after a popular actress of the time. 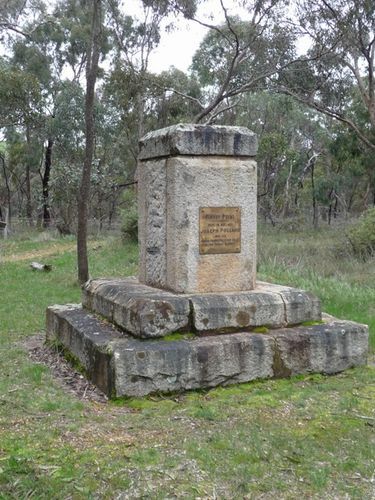 As part of Ararat's centenary celebrations, a memorial commemorating the discovery of gold at Pinkey Point, Cathcart, in May, 1854, was unveiled on yesterday. The Pinkey Point discovery started the Ararat gold rush. The memorial was unveiled by Mrs. P. Nicholson, sister of Air Vice-Marshal Scherger, whose great grandparents were early settlers in the district. The Argus (Melbourne), 3rd October 1956.